As summer comes to a close, it's time once again to continue our family tradition of apple picking. Chihuahua truly loves getting outside and spending a beautiful day with her family and her friend Honey. 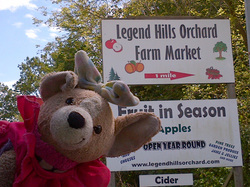 Her most recent outing to Legend Hills Orchard where she helped pick Jonathan apples. 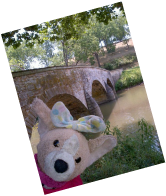 After her family collected a bushel of apples, everyone headed over to Ye Olde Mill to enjoy a picnic and some Velvet ice cream. 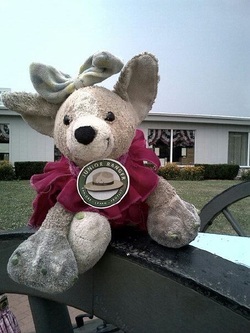 Chihuahua got to tour the ice cream museum, feed some corn to a goat and sheep, and play on the playground equipment. Chihuahua had a blast! Chihuahua in the apple orchard. Chihuahua at the entrance of Ye Olde Mill. Chihuahua in front of the mill. Chihuahua and her friend, Honey, sitting at a table in the 1950's Luncheonette retro display in the ice cream museum. Chihuahua - National Park Junior Ranger. With lots of effort locating various landmarks and learning a little bit about the history of the Civil War, Chihuahua rewarded with knowledge and a sticker about Antitem National Park - famously known as the "Bloodiest Battle" location where the most men died (20,000 people) in one day during the Civil War. Today, Chihuahua ventured out of the house to join the family for my husband's company picnic. What a night. She got the royal treatment tonight - covered event tent with delicious food, good time talking with family, great music, and lots of excitement. 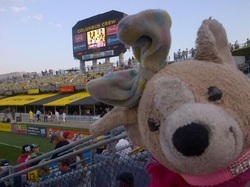 The Columbus Crew was up against the New England Revolution. After some intense defense and a lot of action between the teams, the victory of the night went to The Columbus Crew. Score 4 to 3. Great Job Crew! About five years ago, my mother-in-law came to visit and at some point during her visit we made a trip to our neighborhood Target. We wondered all corners of the store and happened in the toy department with my 2 year old little girl. My daughter's eyes landed on Chihuahua and it was love at first sight. 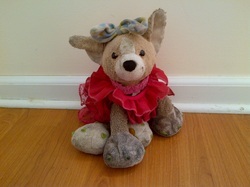 She begged me for this ridiculously dressed (she has on a spotted leopard shirt under the ruffled dress) little stuffed dog. Our house was already consumed by stuffed animals and I could not think of a way to justify another $20 toy to my husband. My daughter had her heart set on the little dog and my mother-in-law just couldn't say no to the little girl with a sad face so she kindly said "oh I'll get it. That's what Nana's are for...." and the rest is history. My first thoughts of bringing this little wild dog into the house was that it would be like every other toy my daughter owned. She would play with Chihuahua for a few days, maybe a couple of weeks, but it would end up in the toy box - forgotten just like the toys before it. Boy, I could not have been more wrong. Since the day Chihuahua has entered our house she has been more than loved (as I'm sure the picture shows). Every night, my daughter must have Chihuahua tucked up under her arm, nestled under her chin before she'll go to sleep. 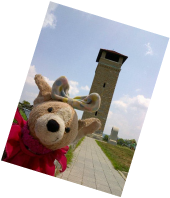 She has travelled just about everywhere you could imagine - dinners at many restaurants, soccer games, toy stores, parks, movies, the zoo, and the beach. She's more well-travelled that some people I know.